Nations Press health Must Read!! 10 Sleeping Position Meanings and What They Reveal About Your Relationship With Your Partner. Must Read!! 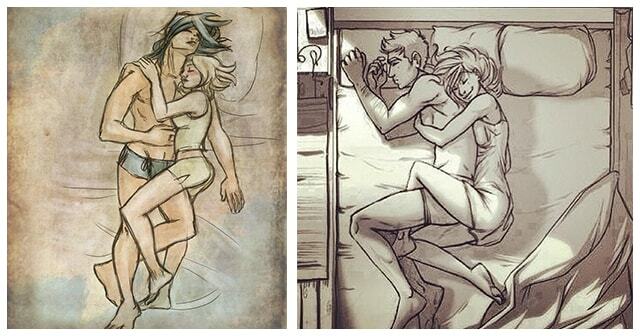 10 Sleeping Position Meanings and What They Reveal About Your Relationship With Your Partner. Sleeping beside your partner can be really sweet and intimate and actually builds your relationship up. In addition, each sleeping position with your partner has something to say about your intimacy or relationship with that person. Your partner wraps herself or himself around the other. It only means you can’t get enough of each other to bear to be apart. This type of position means that both of you are dependent on each other. This position also indicates a sense of protection and security in their relationship. This position has the most physical contact of all which the other partner is showing protection with her or his partner. It could signify a desire for control or power in the relationship. This position only shows that both of you are independent, comfortable and secure in your relationship. Your priority is to have comfort and better sleep without any worry of holding their farts. It only means that you treat each other equally and are not clingy. Still, both connected to each other. This position for a new couple gives each other enough space to adjust but still express their affection by touching each other’s hands to acknowledge their connection with each other. This sleeping position is for couples who to chat heart to heart and take care of each other before going to sleep. When couples sleep face down it means this position is a sign of anxiety and hiding their emotion. Instead of having sweet conversation before sleeping, couple spends more time in the night scrolling in their own mobile phone. This position is slightly distant; perhaps banning phones is a great idea during bedtime. One partner hogs all the bed and overlaps the other’s need for space. This is not a good sign because this shows selfishness and should be worked out on immediately with communicating with each other.